Hello, My name is Steven & hopefully this is the last DJ site you need to visit. Are you looking to make YOUR wedding stand out from the crowd? Want your friends and family walk away with sore feet and awesome memories? You have come to the right place! 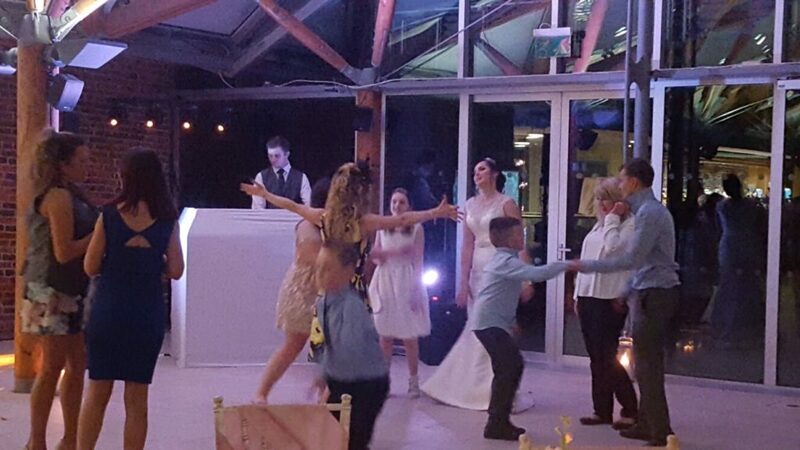 I love nothing more in this job than seeing the happy couple in the centre of the dance floor singing their hearts out surrounded by their friends. I want to inject your personality into the night. 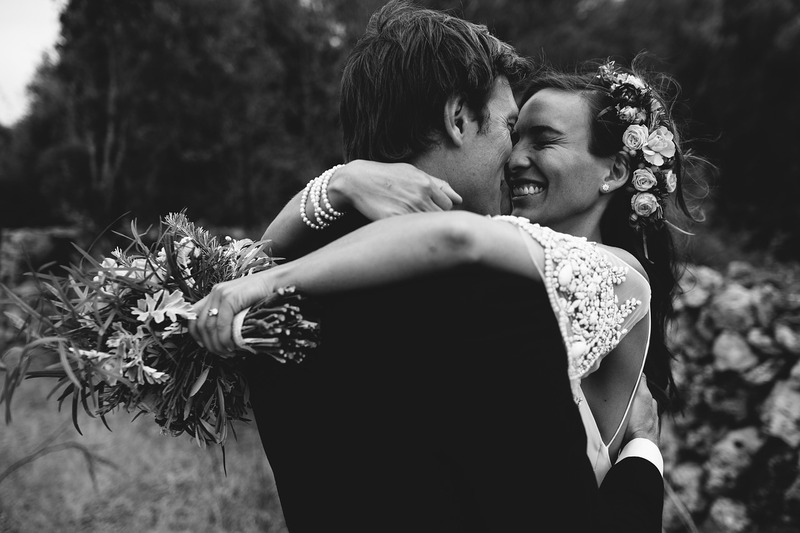 You wouldn't want your wedding to be the same as everybody else's. It should be personal to you both, furthermore It should encompass your guests too, incorporating them into the special day in fun ways to create a fun atmosphere. Get in touch to find out how together, we can create a great party atmosphere for your event. Wow! Where do i begin? What a fantastic DJ Steven is, not only does he provide a beautiful set up but the music is totally tailored to your choice. Steven has been so unbelievably attentive and thorough with the planning from the moment i spoke with him. We also got to relive our Cypriot wedding with his projector to reveal our wedding photos! If you want a party to be proud of & for everyone to enjoy then here's your man!! It’s no surprise to me that every rating on here is 5 stars because Steven is an absolute legend. He prepared things I didn’t even know needed to be checked, and I am so grateful. This lad needs to be the DJ at whatever it is you’re planning, and he is worth every single penny. THANK YOU!!! 100% recommend Steven. He was absolutely amazing, did such a fantastic job with the songs, the dance floor was never empty. 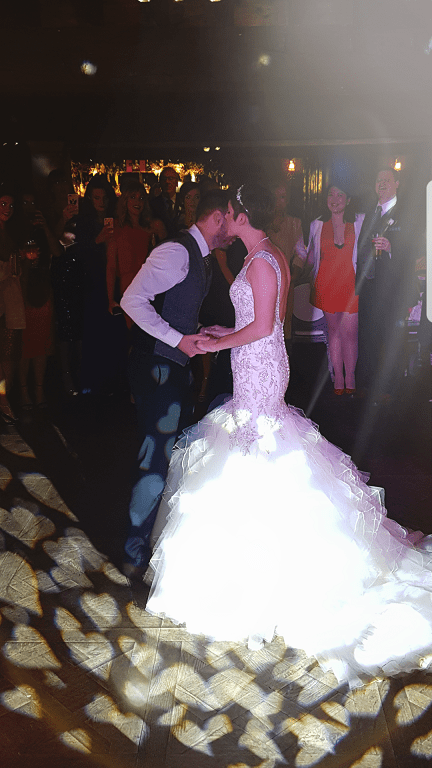 It was the party that we had wanted for our wedding, we couldn't of asked for a better day and I'm so glad I chose Blue Moon! Such a personal service and allowed us to have control over the songs we wanted playing! I chose Steven due to his personal replies (as many other companies had responded with a very impersonal pasted message). Any future parties Steven is now our DJ of choice! A lovely guy. Cannot thank him enough! Thank you so much Steven! You were amazing. The music and lighting turned a great night into a fantastic night. Everyone commented on the choice of music so thank you for that, you guided us well. Thank you once again you were the icing on the cake. I will recommend you to my family and friends without hesitation. Again you were great and I cannot thank you enough. Me & My new Wife couldn't be happier with the service we received. Steven was first class from the moment we met him & played a massive part in making our day so special. Can't recommend him enough! 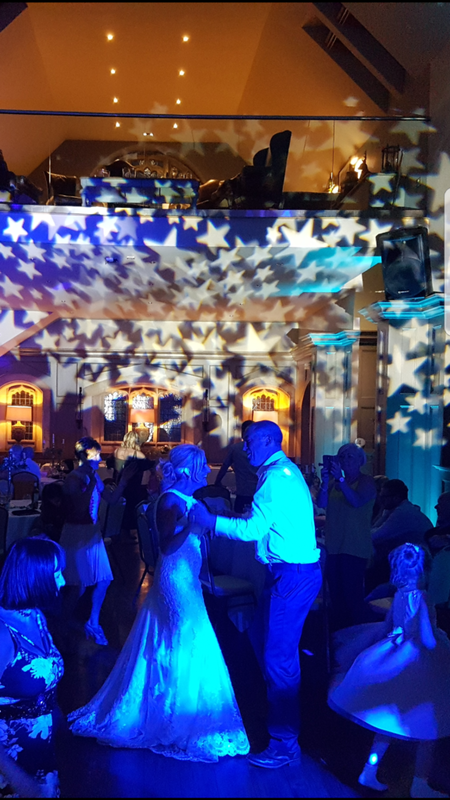 My experience with the Wedding DJ world started when I was a young boy, helping my dad (who had one of the best mobile Discos in the North East) load in at the local venues whenever I could. I learned a lot in those days, most of all my work ethic and passion for music. Fast forward a few years and at 18 I performed my very first wedding, by chance. My Sister had booked a Wedding DJ to perform at her wedding but he didn't show up. The Venue had some equipment so I stepped up and was totally terrified! The venue had a DJ in another room who took me under his wing and helped me hone my performance until I was confident enough to go out on my own. I was a regular performer at that venue for a number of years while building my own Disco, using the name that had been in the Family for more than 30 years, Blue Moon Disco. I left the residency as I started to gain work in a lot of high end venues as couples saw the value in booking a Wedding DJ who cared what they wanted and delivered. Not long after that I got the chance of a huge promotion at work, however I had to move down south with my new Wife to start a new adventure. I kept up with my passion of Music and DJ'd in the North East whenever I could, fitting it around visiting family with my new baby Son. I got the opportunity to come back to the North East, which I jumped at. Since then I have built Blue Moon Discos to one of the best Mobile Discos in the North East with a great reputation amongst clients and my peers. I decided to re-brand and use my name because when people booked me, they got me. I took them through the whole process and it was me who worked with them throughout. 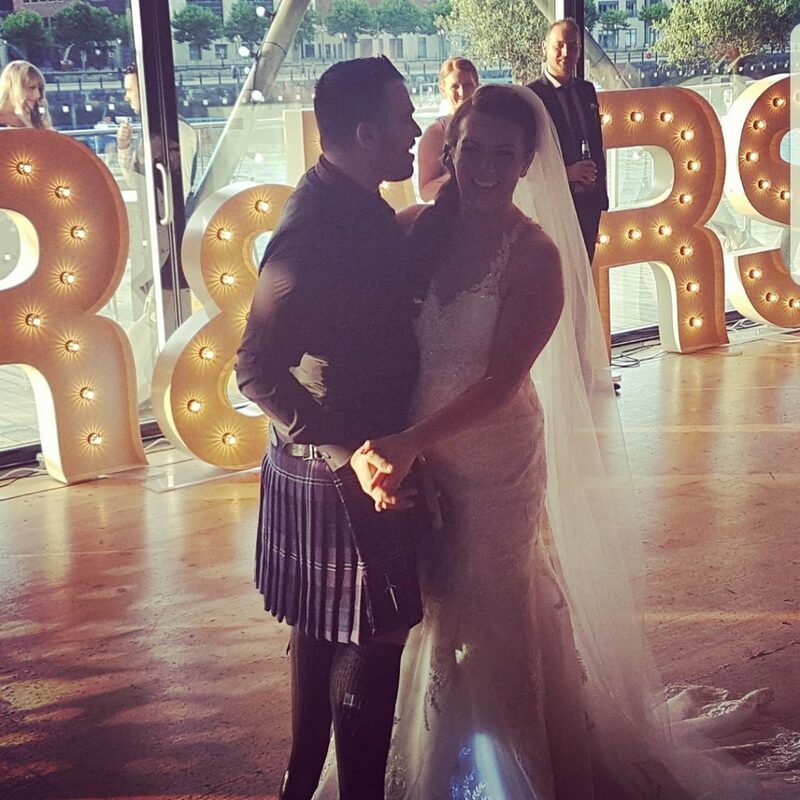 I have created a service I am proud to put my name on and hopefully I can work with you to create a great day and night for your special day. 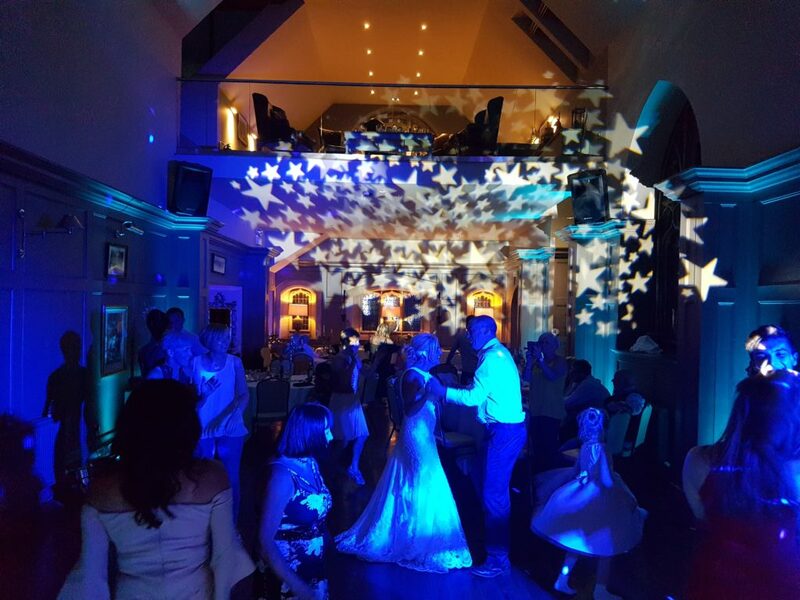 So if you are looking for a North East Mobile Wedding DJ you can trust to deliver a great night, and want quality throughout. Then please get in touch and we can start planning your big day together. I don't offer a standard setup. After all, who wants their wedding to be standard? When you book me you get the choice, you can choose which setup you want for your event. I can offer advice which would look best in a certain venue or with a chosen theme. You can have subtle, a small starlit booth tucked away in the corner with only gentle wash lighting and slimline speakers, a very understated look that has a touch of class about it. You can have my all white premium setup, a White starlit DJ Booth matched with Slimline white speakers and white light fixtures sitting on podiums that can match your chosen colour scheme, perfect for light rooms where a tradtional black setup would stick out like a sore thumb. Or you can go classic black, perfect for darker venues or when you want the Music to be the focus of the evening. or maybe you want that club type feeling? Coming soon also is a rustic option that will go amazing in all the barn venues across this beautiful part of the world. All my lighting is intelligently controlled, so they do exactly what I want them to. 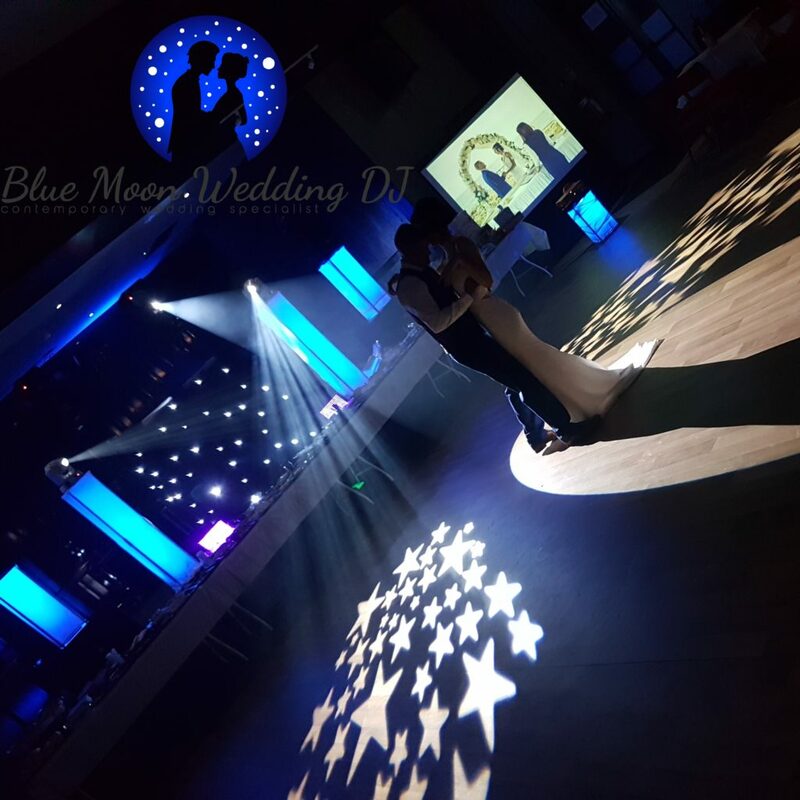 This means after discussions with your photographer, I can set them to what is best so that together we can achieve that perfect image of your first steps on the Dance floor as a married couple. This means if you want to dance on white stars or pink hearts for your first dance I can make that happen! My fee starts at £450. I only offer a small selection of additional services as I like to ensure what I do I can do well. 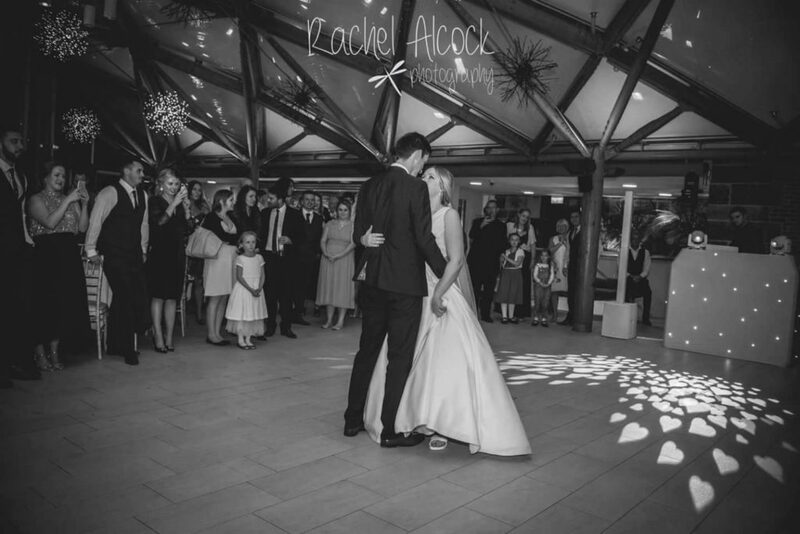 Monogram projection - Your married name projected onto the wall, floor or ceiling of your venue. Uplighting - By placing my wireless controlled uplights around the venue I can transform it at the touch of a button. Its amazing how much this highlights and transforms your venue. Below is a selection of Venues I have been asked to perform. Please note replies might go to Spam/Junk Folder. I ALWAYS reply to messages so if you have not heard from me within 2 days please call/text me or contact me on social media. How can I help? Please use this area to ask any questions or provide further details.